Bohol is a diverse island in the Philippines that offers beautiful marine life, adorable tarsiers and magnificient views of the Chocolate Hills! So many must sees at the same place that you cannot afford to miss it on your trip to the Philippines! People tend to always ask me for my dream destination and I used to answer: the Philippines. With a big smile I can now say that it’s a dreamy destination that I loved a lot! The Philippines is purely great because of the beautiful nature, unbelievably colorful underwater life and genuinely friendly people. Bohol, an island southeast from Cebu, was the first place I visited in the island nation and in this article I will guide you through what to see and do in Bohol and how to get there. There are a few different ways to get to Bohol: you can fly there or you can take a ferry. I flew to Cebu and took a ferry from Cebu port to Tagbilaran port. There are two different ferry companies operating that route: SuperCat and OceanJet. It takes approximately 2 hours to get from Cebu to Bohol and the ticket price depends on the company and which seat you select. I traveled with OceanJet and there were 3 different price categories: business seats, air-conditioned indoor seats called tourist class and open air. I chose the open air seat which was the cheapest one because the air-condition is always too cold for me and I get a flu easily. Open air seat with OceanJet was 450 PHP and then you need to pay 25 PHP terminal fee as well as 50 PHP baggage handling fee. In total I payed 525 PHP for the ferry ride. The baggage handling fee may be different each time or I guess so because on my way back I had to pay a bit more than 50 PHP. As long as you are prepared to pay 50-100 PHP you’ll be fine. Good to know: Be mentally prepared to go through some hassle when taking the ferry and the ferry might leave late so don’t plan a tight schedule for catching a flight. Read more from my blogpost on how to get to Bohol from the Cebu airport by ferry! Found my perfect place: hammock and a good book! The most popular place to stay in Bohol is Panglao island which is connected to Bohol island by a bridge. Panglao offers a lot of different beaches to choose from but the one with most service is Alona beach. There are quite a lot of restaurants to choose from as well as different kind of accommodation from 5 star resorts to hostels. I stayed in a basic hotel with no other luxuries than a hot shower and air conditioning. And a common pool of course which wasn’t big but it was enough for me! The main beach at Alona is actually long and beautiful. It has powder white sand and turquoise water. It’s quite crowded at some parts though and it may be hard to find shade if you need one. But you can always go for a mango shake to the nearby restaurants like I did! Mango shake with a view! There are many cozy restaurants by the beach that have a beautiful view to the sea and a very nice ambiance in the evening. Some bars might be a bit loud though but you can choose the more silent and relaxed ones too. What was surprising to me was that most of the restaurants have live music and the singers are really good. At times I found it a bit bothering though when trying to eat in a restaurant and talk to your table company when the music is blasting. If you’d like to have a large variety of restaurants and service as well as a beautiful beach, go to Alona! I visited Dumaluan beach twice which is another long beach five kilometers from Alona. The footpaths aren’t too good so I recommend taking a tricycle which was only 100 PHP (about 2 euros) for two people. There’s also an entrance fee to the beach for 25 PHP per person. They use the fee to provide the shower and toilet facilities or at least that’s what the clerk said. Dumaluan beach is a good beach for snorkeling! The beach is totally worth visiting! Take your snorkel and fins or reef shoes with you since the underwater world is amazing there. Just a very short swim away from the beach you can see beautiful corals as well as starfish and so many other beautiful sea creatures for example Parrot fish, “Nemos”, Moorish idol fish, angelfish and much much more. There were quite a lot of sea urchins too and I also spotted a jellyfish so be careful. Just remember that never touch anything underwater and never ever take a starfish out of water! That kills the starfish. Be careful where you put your feet and always make sure it’s sand. I became so sad when I saw people stepping over the corals. Please remember to preserve the nature! There aren’t too many corals left so let’s be mindful when we are snorkeling. Dumaluan beach has nice restaurants on the beach and the food I tasted there was suberb! I don’t know if I would like to stay there instead of Alona – maybe if I had a scooter – but it’s a must-visit beach to my mind! One of the best dishes I had in the Philippines! The Chocolate hills have a peculiar name and it’s due to their color in the dry season when they turn brown and look like chocolate. These hills are located in the center of Bohol and there is a special viewpoint where you can see the best part of the hills. What’s special about these hills is that no trees grow on top of them so they are covered in grass which emphasizes their round shape. Chocolate hills are often called “the eight wonder of the world”. I decided to rent a scooter which I can recommend if you’re not afraid of driving and you are comfortable riding for 2,5 hours one way. If not, you can see them as part of a tour or just rent a van transfer. If you choose to have a scooter, there are a lot of places to rent them in Alona Beach. Just try to pick the one that you feel is trustworthy. But DO NOT rent the scooter from Alonaland Resort! Long story short: we got a flat tire twice and the rental company wasn’t very cooperative or helpful with the matter. I arrived at the viewpoint around 1 pm and it wasn’t too crowded. The people who sold me the parking ticket warned me how there are 200 steps and it’s going to be a tough climb. Oh well, I don’t think it was that hard. I wasn’t really out of breath or anything. And what’s great is that there are places where to rest if the climb feels too heavy on one go! The views were really beautiful over the Chocolate Hills even though in February they were still green! There’s a viewing terrace for the Chocolate hills! You cannot miss the tarsiers when you are visiting Bohol! Those cuties were the must see for me on my trip to the Philippines and the main reason why I chose to go to Bohol out of all the places! When you go to see them make sure that you go to the Corella Tarsier and Wildlife Sanctuary instead of the Loboc Tarsier Conservation area. Really believe me, don’t go to the conservation area! According to other bloggers, the Loboc tarsiers are kept awake even though they are nocturnal animals and they are moved to their branches for the daytime which are covered with wood and they aren’t free to move where they want to. 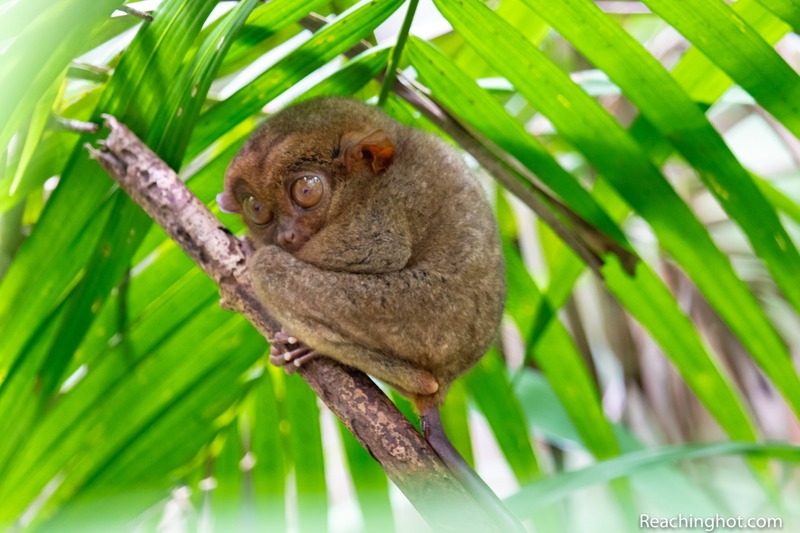 The tarsiers get very easily stressed and can become even suicidal in captivity. Most of the tarsiers I saw were sleeping. They are so cute! In Corella Sanctuary tarsiers can move wherever they want to and even leave the place. The sanctuary is surrounded with walls to prevent predators from entering the grounds. In the sanctuary you will participate in a guided tour where there’s a guide near every tarsier tree. You cannot go too close, you have to keep your voice down and you cannot use your flash. Most of the tarsiers will be sleeping as they are supposed to during the daytime but if you’re lucky some might be awake. What creatures are tarsiers actually? No, they are not monkeys, they are actually the smallest primate species. They have the largest eye-to-body ratio so their eyes look huge! Interesting is that they cannot move their eyes but they can turn their head 180 degrees. Such cool creatures they are! They are also endangered and it’s caused by habitat destruction, pet traders and poaching. Some of them opened their eyes for a while and then went back sleep again. These adorable creatures are worth seeing but remember to go to Corella to see them!